TurboZIP is a secure archive and Email management tool that offers an amazing depth of features with an easily accessible interface. 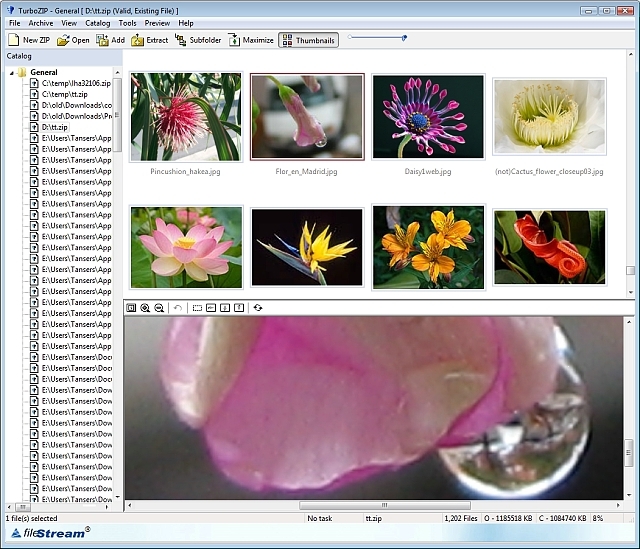 It opens ZIP, RAR, and all major archive formats with over 200 supported internal thumbnail and viewing formats. Quick and easy way for the splitting files into any number of smaller files as well as joining components back into the original file for Windows. The number of files can be entered or calculated based on expected length of individual files (in bytes or number of lines for text files). Once file components are generated they can be emailed using default e-mail account and to any contact from the contact list (Outlook 2003 or 2007) or using SMTP directly. Owing to the file naming schema, joining components back into original file is only a two step process. Only one component needs to be selected and clicking on the Join button will simply activate that process. 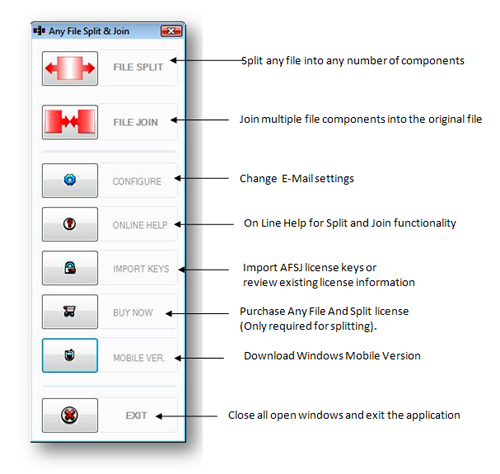 AFSJ is performing a binary Split and Join (by default) and therefore can split and/or join any file such as: pdf, wav, mp3, xls, rtf, txt, iso, avi, png, jpeg, gif, zip, rar, html, doc, eps, avi, bmp, exe, ico, xml, js, css, etc. Text files can be split and join by using number of lines as criteria. On-line help and detailed documentation combined with intuitive user interface provides pleasant user experience. Supports drag-and-drop, multithreading, progress display, cancelation of active process etc. Paired with AFSJM for Windows Mobile Devices, ASFJ can easily exchange music, pictures, or video files via e-mail, in close to real time between PC and mobile device (phone, PDAa?|), completely avoiding e-mail size limitations. At the same time AFSJM application effectively preserves available space on your mobile device. Compressing and uncompressing files are common operations just like copying and deleting. 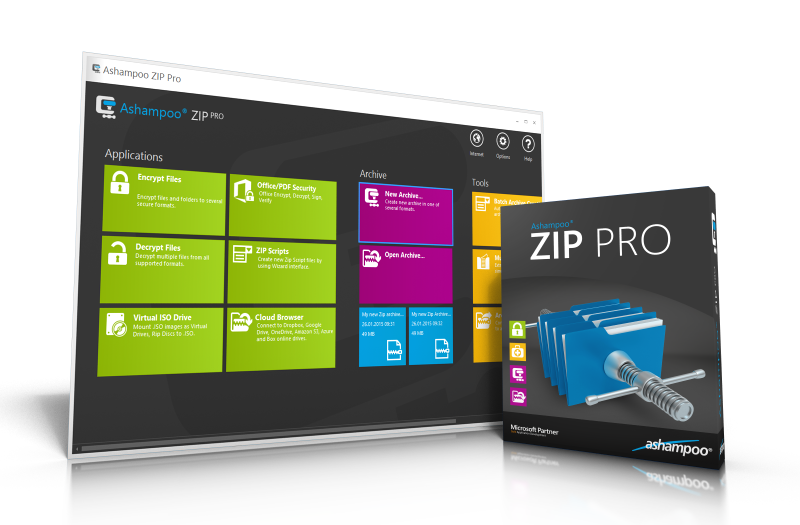 Ashampoo ZIP Pro not only works with all compression formats but offers extra security in the form of file encryption. The application seamlessly integrates with Windows Explorer and provides convenient status updates as well as jump lists through the taskbar on Windows 7 and 8. Program features are presented through a Windows 8 like tile-based interface that displays essential features as rearrangeable tiles. Apart from file compression, Ashampoo ZIP Pro features powerful file encryption with multiple algorithms to protect files against unauthorized access. For more security and credibility, the program also encrypts and signs Office and PDF files which is highly recommended for official business or other sensitive documents. The application offers various additional features such as self-extracting archives that may be opened on any PC without additional software or archive conversion into different formats. Even damaged archives can be repaired with the application. Files that are part of ISO images can easily be accessed through a virtual disk drive that also comes with the product. Finally, the integrated disc ripping feature can even create ISO images for you. 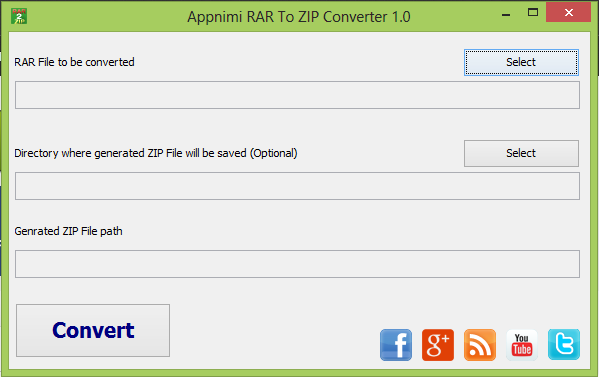 December 14, 2014 File Compression, Software, UtilitiesConvert Pdf to Word,Inc. Advanced all to PDF is a fast and affordable PDF conversion tool to help you batch convert Word documents, PowerPoint presentations, Excel Spreadsheets to PDF files quickly and accurately. The original contents including formatting and layouts are exactly retained in the converted PDF files. The conversion allows you to add PDF properties to the output PDF file, like author, passwords, allowed actions, etc. Moreover, Batch conversion and partial conversion are supported, which make your conversion more efficient. Advancd Excel to PDF is a fast, affordable utility to allow you to batch convert Microsoft Excel spreadsheets into professional-quality documents in PDF file format. And you can easily add properties like author, passwords, allowed actions to the output PDF file. Moreover, Advanced PDF To Word is a standalone application, and does not require Adobe Acrobat Pro which costs hundreds of dollars.